Dilbert: Maybe I’m unlucky in love because I’m so knowledgeable about science that I intimidate people. Their intimidation becomes low self-esteem, then they reject me to protect their egos. Dilbert: What is “Occam's Razor”? Dogbert: A guy named Occam had a rule about the world. Basically he said that when there are multiple explanations for something the simplest explanation is usually correct. The simplest explanation for your poor love life is that you’re immensely unattractive. Dilbert: Maybe Occam had another rule that specifically exempted this situation, but his house burned down with all his notes. Then he forgot. Dogbert: I don’t think we can rule it out at this point. Dilbert comic strip (11 Jul 1993). A discovery must be, by definition, at variance with existing knowledge. During my lifetime, I made two. Both were rejected offhand by the popes of the field. Had I predicted these discoveries in my applications, and had those authorities been my judges, it is evident what their decisions would have been. In 'Dionysians and Apollonians', Science (2 Jun 1972), 176, 966. Reprinted in Mary Ritchie Key, The Relationship of Verbal and Nonverbal Communication (1980), 318. A schism has taken place among the chemists. A particular set of them in France have undertaken to remodel all the terms of the science, and to give every substance a new name, the composition, and especially the termination of which, shall define the relation in which it stands to other substances of the same family, But the science seems too much in its infancy as yet, for this reformation; because in fact, the reformation of this year must be reformed again the next year, and so on, changing the names of substances as often as new experiments develop properties in them undiscovered before. The new nomenclature has, accordingly, been already proved to need numerous and important reformations. ... It is espoused by the minority here, and by the very few, indeed, of the foreign chemists. It is particularly rejected in England. Letter to Dr. Willard (Paris, 1788). In Thomas Jefferson and John P. Foley (ed. ), The Jeffersonian Cyclopedia (1900), 135. From H.A. Washington, The Writings of Thomas Jefferson (1853-54). Vol 3, 15. All possible truth is practical. To ask whether our conception of chair or table corresponds to the real chair or table apart from the uses to which they may be put, is as utterly meaningless and vain as to inquire whether a musical tone is red or yellow. No other conceivable relation than this between ideas and things can exist. The unknowable is what I cannot react upon. The active part of our nature is not only an essential part of cognition itself, but it always has a voice in determining what shall be believed and what rejected. The Muscular Perception of Space (1878), 446. And if you want the exact moment in time, it was conceived mentally on 8th March in this year one thousand six hundred and eighteen, but submitted to calculation in an unlucky way, and therefore rejected as false, and finally returning on the 15th of May and adopting a new line of attack, stormed the darkness of my mind. So strong was the support from the combination of my labour of seventeen years on the observations of Brahe and the present study, which conspired together, that at first I believed I was dreaming, and assuming my conclusion among my basic premises. But it is absolutely certain and exact that the proportion between the periodic times of any two planets is precisely the sesquialterate proportion of their mean distances. Harmonice Mundi, The Harmony of the World (1619), book V, ch. 3. Trans. E. J. Aiton, A. M. Duncan and J. V. Field (1997), 411. Any one whose disposition leads him to attach more weight to unexplained difficulties than to the explanation of facts will certainly reject my theory. The Origin of Species (1859), 482. As was the case for Nobel's own invention of dynamite, the uses that are made of increased knowledge can serve both beneficial and potentially harmful ends. Increased knowledge clearly implies increased responsibility. We reject the notion advocated in some quarters that man should stop eating from the tree of knowledge, as if that were humanly possible. From Nobel Banquet Speech (10 Dec 1981), in Wilhelm Odelberg (ed. ), Les Prix Nobel 1981 (1981), 44. Bohr’s standpoint, that a space-time description is impossible, I reject a limine. Physics does not consist only of atomic research, science does not consist only of physics, and life does not consist only of science. The aim of atomic research is to fit our empirical knowledge concerning it into our other thinking. All of this other thinking, so far as it concerns the outer world, is active in space and time. If it cannot be fitted into space and time, then it fails in its whole aim and one does not know what purpose it really serves. Letter to Willy Wien (25 Aug 1926). Quoted in Walter Moore, Schrödinger: Life and Thought (1989), 226. But it seems to me equally obvious that the orderliness is not all-pervasive. There are streaks of order to be found among the chaos, and the nature of scientific method is to seek these out and to stick to them when found and to reject or neglect the chaos. It is obvious that we have succeeded in finding some order in nature, but this fact in itself does not prove anything farther. Scientific Method: An Inquiry into the Character and Validy of Natural Law (1923), 200. But shall gravity be therefore called an occult cause, and thrown out of philosophy, because the cause of gravity is occult and not yet discovered? Those who affirm this, should be careful not to fall into an absurdity that may overturn the foundations of all philosophy. For causes usually proceed in a continued chain from those that are more compounded to those that are more simple; when we are arrived at the most simple cause we can go no farther ... These most simple causes will you then call occult and reject them? Then you must reject those that immediately depend on them. But while I accept specialization in the practice, I reject it utterly in the theory of science. From An Introduction to the Study of Experimental Medicine (1865), as translated by Henry Copley Greene (1957), 25. Do not expect to be hailed as a hero when you make your great discovery. More likely you will be a ratbag—maybe failed by your examiners. Your statistics, or your observations, or your literature study, or your something else will be patently deficient. Do not doubt that in our enlightened age the really important advances are and will be rejected more often than acclaimed. Nor should we doubt that in our own professional lifetime we too will repudiate with like pontifical finality the most significant insight ever to reach our desk. Theories of the Earth and Universe (1988), 365. Every discoverer of a new truth, or inventor of the method which evolves it, makes a dozen, perhaps fifty, useless combinations, experiments, or trials for one successful one. In the realm of electricity or of mechanics there is no objection to this. But when such rejected failures involve a torture of animals, sometimes fearful in its character, there is a distinct objection to it. From 'Vivisection', an original paper in Surgical Anaesthesia: Addresses, and Other Papers (1894, 1900), 369-370. Everything material which is the subject of knowledge has number, order, or position; and these are her first outlines for a sketch of the universe. If our feeble hands cannot follow out the details, still her part has been drawn with an unerring pen, and her work cannot be gainsaid. So wide is the range of mathematical sciences, so indefinitely may it extend beyond our actual powers of manipulation that at some moments we are inclined to fall down with even more than reverence before her majestic presence. But so strictly limited are her promises and powers, about so much that we might wish to know does she offer no information whatever, that at other moments we are fain to call her results but a vain thing, and to reject them as a stone where we had asked for bread. If one aspect of the subject encourages our hopes, so does the other tend to chasten our desires, and he is perhaps the wisest, and in the long run the happiest, among his fellows, who has learned not only this science, but also the larger lesson which it directly teaches, namely, to temper our aspirations to that which is possible, to moderate our desires to that which is attainable, to restrict our hopes to that of which accomplishment, if not immediately practicable, is at least distinctly within the range of conception. From Presidential Address (Aug 1878) to the British Association, Dublin, published in the Report of the 48th Meeting of the British Association for the Advancement of Science (1878), 31. History warns us … that it is the customary fate of new truths to begin as heresies and to end as superstitions; and, as matters now stand, it is hardly rash to anticipate that, in another twenty years, the new generation, educated under the influences of the present day, will be in danger of accepting the main doctrines of the “Origin of Species,” with as little reflection, and it may be with as little justification, as so many of our contemporaries, twenty years ago, rejected them. 'The Coming of Age of the Origin of Species' (1880). In Collected Essays, Vol. 2: Darwiniana (1893), 229. Humans are not by nature the fact-driven, rational beings we like to think we are. We get the facts wrong more often than we think we do. And we do so in predictable ways: we engage in wishful thinking. We embrace information that supports our beliefs and reject evidence that challenges them. Our minds tend to take shortcuts, which require some effort to avoid … [and] more often than most of us would imagine, the human mind operates in ways that defy logic. As co-author with Kathleen Hall Jamieson, in unSpun: Finding Facts in a World of Disinformation (2007), 69. I contend that the continued racial classification of Homo sapiens represents an outmoded approach to the general problem of differentiation within a species. In other words, I reject a racial classification of humans for the same reasons that I prefer not to divide into subspecies the prodigiously variable West Indian land snails that form the subject of my own research. I do not maintain that the chief value of the study of arithmetic consists in the lessons of morality that arise from this study. I claim only that, to be impressed from day to day, that there is something that is right as an answer to the questions with which one is able to grapple, and that there is a wrong answer—that there are ways in which the right answer can be established as right, that these ways automatically reject error and slovenliness, and that the learner is able himself to manipulate these ways and to arrive at the establishment of the true as opposed to the untrue, this relentless hewing to the line and stopping at the line, must color distinctly the thought life of the pupil with more than a tinge of morality. … To be neighborly with truth, to feel one’s self somewhat facile in ways of recognizing and establishing what is right, what is correct, to find the wrong persistently and unfailingly rejected as of no value, to feel that one can apply these ways for himself, that one can think and work independently, have a real, a positive, and a purifying effect upon moral character. They are the quiet, steady undertones of the work that always appeal to the learner for the sanction of his best judgment, and these are the really significant matters in school work. It is not the noise and bluster, not even the dramatics or the polemics from the teacher’s desk, that abide longest and leave the deepest and stablest imprint upon character. It is these still, small voices that speak unmistakably for the right and against the wrong and the erroneous that really form human character. When the school subjects are arranged on the basis of the degree to which they contribute to the moral upbuilding of human character good arithmetic will be well up the list. In Arithmetic in Public Education (1909), 18. As quoted and cited in Robert Édouard Moritz, Memorabilia Mathematica; Or, The Philomath’s Quotation-book (1914), 69. I do not … reject the use of statistics in medicine, but I condemn not trying to get beyond them and believing in statistics as the foundation of medical science. … Statistics … apply only to cases in which the cause of the facts observed is still [uncertain or] indeterminate. … There will always be some indeterminism … in all the sciences, and more in medicine than in any other. But man’s intellectual conquest consists in lessening and driving back indeterminism in proportion as he gains ground for determinism by the help of the experimental method..
From An Introduction to the Study of Experimental Medicine (1865), as translated by Henry Copley Greene (1957), 138-140. I have long since come to see that no one deserves either praise or blame for the ideas that come to him, but only for the actions resulting therefrom. Ideas and beliefs are certainly not voluntary acts. They come to us—we hardly know how or whence, and once they have got possession of us we can not reject or change them at will. It is for the common good that the promulgation of ideas should be free—uninfluenced by either praise or blame, reward or punishment. But the actions which result from our ideas may properly be so treated, because it is only by patient thought and work, that new ideas, if good and true, become adopted and utilized; while, if untrue or if not adequately presented to the world, they are rejected or forgotten. In 'The Origin of the Theory of Natural Selection', Popular Science Monthly (1909), 74, 400. I have therefore tried to show the tendency displayed throughout history, by the most profound investigators, to pass from the world of the senses to a world where vision becomes spiritual, where principles are elaborated, and from which the explorer emerges with conceptions and conclusions, to be approved or rejected according as they coincide with sensible things. Heat, A Mode of Motion (1880, 1915), 6th ed., viii. I must reject fluids and ethers of all kinds, magnetical, electrical, and universal, to whatever quintessential thinness they may be treble distilled, and (as it were) super-substantiated. Hints Towards the Formation of a more Comprehensive Theory of Life (1848). In The Collected Works of Samuel Taylor Coleridge: Shorter Works and Fragments (1995), H. J. Jackson and J. R. de J. Jackson (eds. ), Vol 11, 1, 502. If an idea presents itself to us, we must not reject it simply because it does not agree with the logical deductions of a reigning theory. In every work of genius we recognize our own rejected thoughts; they come back to us with a certain alienated majesty. In 'Self-Reliance', The Prose Works of Ralph Waldo Emerson (1870), Vol. 1, 241. In reality, all Arguments from Experience are founded on the Similarity which we discover among natural Objects, and by which we are induc'd to expect effects similar to those which we have found to follow from such Objects. And tho' none but a Fool or Madman will ever pretend to dispute the Authority of Experience, or to reject that great Guide of human Life, it may surely be allow'd a Philosopher to have so much Curiosity at least as to examine the Principle of human Nature, which gives this mighty Authority to Experience, and makes us draw Advantage from that Similarity which Nature has plac'd among different Objects. From Causes which appear similar we expect similar Effects. This is the Sum of our experimental Conclusions. An Enquiry Concerning Human Understanding (1748), 63. It may be observed of mathematicians that they only meddle with such things as are certain, passing by those that are doubtful and unknown. They profess not to know all things, neither do they affect to speak of all things. What they know to be true, and can make good by invincible arguments, that they publish and insert among their theorems. Of other things they are silent and pass no judgment at all, chusing [choosing] rather to acknowledge their ignorance, than affirm anything rashly. They affirm nothing among their arguments or assertions which is not most manifestly known and examined with utmost rigour, rejecting all probable conjectures and little witticisms. They submit nothing to authority, indulge no affection, detest subterfuges of words, and declare their sentiments, as in a Court of Judicature [Justice], without passion, without apology; knowing that their reasons, as Seneca testifies of them, are not brought to persuade, but to compel. It will be a general expression of the facts that have been detailed, relating to the changes and transitions by electricity, in common philosophical language, to say, that hydrogen, the alkaline substances, the metals, and certain metallic oxides, are all attracted by negatively electrified metallic surfaces; and contrariwise, that oxygen and acid substances are attracted by positively electrified metallic surfaces and rejected by negatively electrified metallic surfaces; and these attractive and repulsive forces are sufficiently energetic to destroy or suspend the usual operation of elective affinity. Bakerian Lecture, 'On Some Chemical Agencies of Electricity', Philosophical Transactions of the Royal Society, 1807, 97, 28-29. Most of the crackpot papers which are submitted to The Physical Review are rejected, not because it is impossible to understand them, but because it is possible. Those which are impossible to understand are usually published. When the great innovation appears, it will almost certainly be in a muddled, incomplete and confusing form. To the discoverer himself it will be only half-understood; to everybody else it will be a mystery. For any speculation which does not at first glance look crazy, there is no hope. In 'Innovation in Physics', Scientific American (Sep 1958), 199. Collected in From Eros to Gaia (1993). Much later, when I discussed the problem with Einstein, he remarked that the introduction of the cosmological term was the biggest blunder he ever made in his life. But this “blunder,” rejected by Einstein, is still sometimes used by cosmologists even today, and the cosmological constant denoted by the Greek letter Λ rears its ugly head again and again and again. No other explanation of living forms is allowed than heredity, and any which is founded on another basis must be rejected. The present fashion requires that even the smallest and most indifferent inquiry must be dressed in phylogenetic costume, and whilst in former centuries authors professed to read in every natural detail some intention of the creator mundi, modern scientists have the aspiration to pick out from every occasional observation a fragment of the ancestral history of the living world. 'On the Principles of Animal Morphology', Proceedings of the Royal Society of Edinburgh (2 Apr 1888), 15, 294. Original as Letter to Mr John Murray, communicated to the Society by Professor Sir William Turner. Page given as in collected volume published 1889. On becoming very intimate with Fitz-Roy, I heard that I had run a very narrow risk of being rejected, on account of the shape of my nose! He was an ardent disciple of Lavater, and was convinced that he could judge a man's character by the outline of his features. He doubted whether anyone with my nose could possess sufficient energy and determination for the voyage. I think he was well-satisfied that my nose had spoken falsely. In Charles Darwin and Francis Darwin (ed. ), The Life and Letters of Charles Darwin: Including an Autobiographical Chapter (1896), 50. Psychologists … have found that people making an argument or a supposedly factual claim can manipulate us by the words they choose and the way they present their case. We can’t avoid letting language do our thinking for us, but we can become more aware of how and when language is steering us toward a conclusion that, upon reflection, we might choose to reject. As co-author with Kathleen Hall Jamieson, in unSpun: Finding Facts in a World of Disinformation (2007), 70. Quantum mechanics and relativity, taken together, are extraordinarily restrictive, and they therefore provide us with a great logical machine. We can explore with our minds any number of possible universes consisting of all kinds of mythical particles and interactions, but all except a very few can be rejected on a priori grounds because they are not simultaneously consistent with special relativity and quantum mechanics. Hopefully in the end we will find that only one theory is consistent with both and that theory will determine the nature of our particular universe. Revolutions of ages do not oft recover the loss of a rejected truth, for the want of which whole nations fare the worse. In Areopagitica: A speech of Mr John Milton for the Liberty of Unlicenced printing to the Parliament of England (23 Nov 1644), 4. Science differs from politics or religion, in precisely this one discipline: we agree in advance to simply reject our own findings when they have been shown to be in error. Since religion intrinsically rejects empirical methods, there should never be any attempt to reconcile scientific theories with religion. [An infinitely old universe, always evolving may not be compatible with the Book of Genesis. However, religions such as Buddhism get along without having any explicit creation mythology and are in no way contradicted by a universe without a beginning or end.] Creatio ex nihilo, even as religious doctrine, only dates to around AD 200. The key is not to confuse myth and empirical results, or religion and science. Quoted in Anthony L. Peratt, 'Dean of the Plasma Dissidents', Washington Times, supplement: The World and I (May 1988),196. The employment of mathematical symbols is perfectly natural when the relations between magnitudes are under discussion; and even if they are not rigorously necessary, it would hardly be reasonable to reject them, because they are not equally familiar to all readers and because they have sometimes been wrongly used, if they are able to facilitate the exposition of problems, to render it more concise, to open the way to more extended developments, and to avoid the digressions of vague argumentation. The framing of hypotheses is, for the enquirer after truth, not the end, but the beginning of his work. Each of his systems is invented, not that he may admire it and follow it into all its consistent consequences, but that he may make it the occasion of a course of active experiment and observation. And if the results of this process contradict his fundamental assumptions, however ingenious, however symmetrical, however elegant his system may be, he rejects it without hesitation. He allows no natural yearning for the offspring of his own mind to draw him aside from the higher duty of loyalty to his sovereign, Truth, to her he not only gives his affections and his wishes, but strenuous labour and scrupulous minuteness of attention. Philosophy of the Inductive Sciences (1847), Vol. 2, 57. 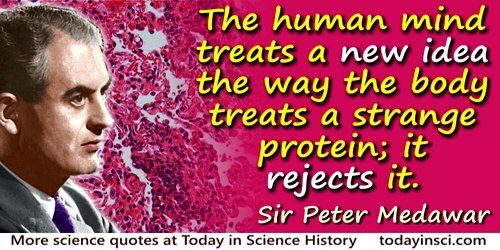 The human mind treats a new idea the way the body treats a strange protein; it rejects it. The Art of the Soluble (1967). Quoted in Colin J. Sanderson, Understanding Genes and GMOs (2007), 1. The human understanding is of its own nature prone to suppose the existence of more order and regularity in the world than it finds. And though there be many things in nature which are singular and unmatched, yet it devises for them parallels and conjugates and relatives which do not exist. Hence the fiction that all celestial bodies move in perfect circles, spirals and dragons being (except in name) utterly rejected. From Aphorism 45, Novum Organum, Book I (1620). Collected in James Spedding (ed. ), The Works of Francis Bacon (1858), Vol. 4, 55. The human understanding when it has once adopted an opinion (either as being the received opinion or as being agreeable to itself) draws all things else to support and agree with it. And though there be a greater number and weight of instances to be found on the other side, yet these it either neglects and despises, or else by some distinction sets aside and rejects, in order that by this great and pernicious predetermination the authority of its former conclusions may remain inviolate. From Aphorism 46, Novum Organum, Book I (1620). Collected in James Spedding (ed. ), The Works of Francis Bacon (1858), Vol. 4, 56. The Wegener hypothesis has been so stimulating and has such fundamental implications in geology as to merit respectful and sympathetic interest from every geologist. Some striking arguments in his favor have been advanced, and it would be foolhardy indeed to reject any concept that offers a possible key to the solution of profound problems in the Earth's history. Published while geologists remained sceptical of Alfred Wegener's idea of Continental Drift, Though unconvinced, he published these thoughts suggesting that critics should be at least be open-minded. His patience was proven justified when two decades later, the theory of plate tectonics provided a mechanism for the motion of the continents. Some Thoughts on the Evidence for Continental Drift (1944). They [mathematicians] only take those things into consideration, of which they have clear and distinct ideas, designating them by proper, adequate, and invariable names, and premising only a few axioms which are most noted and certain to investigate their affections and draw conclusions from them, and agreeably laying down a very few hypotheses, such as are in the highest degree consonant with reason and not to be denied by anyone in his right mind. In like manner they assign generations or causes easy to be understood and readily admitted by all, they preserve a most accurate order, every proposition immediately following from what is supposed and proved before, and reject all things howsoever specious and probable which can not be inferred and deduced after the same manner. In Mathematical Lectures (1734), 65-66. Those who reject biological evolution do so, usually, not out of reason, but out of unjustified vanity. Epigraph in Isaac Asimov’s Book of Science and Nature Quotations (1988), 86. True physics was founded the day when Galileo, rejecting fruitless speculations, conceived the idea … of defining the general form to give to experiments, by assigning for their immediate purpose the measure of all that can be measurable in natural phenomena. From the original French, “La vraie physique a été fondée le jour où Galilée, rejetant des spéculations depuis si longtemps stériles, a conçu l’idée … de préciser la forme générale à donner aux expériences, en leur assignant pour objet immédiat la mesure de tout ce qui peut être mesurable dans les phénomènes naturels,” in De l’origine et des limites de la correspondance entre l’algèbre et la géométrie (1847), 375. English version by Webmaster using Google translate. This may be the basis of Thomas-Henri Martin describing Galileo’s experimental method , often translated as Measure what is measurable, and make measurable what is not so, from the original French in Galilée: Les droits de la science et la méthode des sciences physiques (1868), 289. Note that in both cases, the words were narrative by the authors, not quoting actual words by Galileo. What the authors wrote was in their own words, and should not be attributed to Galileo with quotation marks. We have many men of science; too few men of God. We have grasped the mystery of the atom and rejected the Sermon on the Mount. Speech (10 Nov 1948) preceding Armistice Day, Collected Writings (1967), Vol. 1. Quoted in Bulletin of the Atomic Scientists (Apr 1952), 8, No. 4, 114. We inhabit a complex world. Some boundaries are sharp and permit clean and definite distinctions. But nature also includes continua that cannot be neatly parceled into two piles of unambiguous yeses and noes. Biologists have rejected, as fatally flawed in principle, all attempts by antiabortionists to define an unambiguous ‘beginning of life,’ because we know so well that the sequence from ovulation or spermatogenesis to birth is an unbreakable continuum–and surely no one will define masturbation as murder. We must not, however, reject all discoveries of secrets and all new inventions. It is with them as with theatrical pieces, there may be one good out of a thousand. In A Philosophical Dictionary (1824), Vol. 1, 66. We must reject the false choice between combating climate change and fostering strong economic growth. If any country can prove that, it’s the United States. In Hillary Clinton, 'Hillary Clinton: America Must Lead at Paris Climate Talks', Time (29 Nov 2015). What has been learned in physics stays learned. People talk about scientific revolutions. The social and political connotations of revolution evoke a picture of a body of doctrine being rejected, to be replaced by another equally vulnerable to refutation. It is not like that at all. The history of physics has seen profound changes indeed in the way that physicists have thought about fundamental questions. But each change was a widening of vision, an accession of insight and understanding. The introduction, one might say the recognition, by man (led by Einstein) of relativity in the first decade of this century and the formulation of quantum mechanics in the third decade are such landmarks. The only intellectual casualty attending the discovery of quantum mechanics was the unmourned demise of the patchwork quantum theory with which certain experimental facts had been stubbornly refusing to agree. As a scientist, or as any thinking person with curiosity about the basic workings of nature, the reaction to quantum mechanics would have to be: “Ah! So that’s the way it really is!” There is no good analogy to the advent of quantum mechanics, but if a political-social analogy is to be made, it is not a revolution but the discovery of the New World. From Physics Survey Committee, U.S. National Academy of Sciences, National Research Council, 'The Nature of Physics', in report Physics in Perspective (1973), 61-62. As cited in I. Bernard Cohen, Revolution in Science (1985), 554-555. What the use of P [the significance level] implies, therefore, is that a hypothesis that may be true may be rejected because it has not predicted observable results that have not occurred. Theory of Probability (1939), 316. When someone admits one and rejects another which is equally in accordance with the appearances, it is clear that he has quitted all physical explanation and descended into myth. Letter to Pythocles, 87. Trans. R. W. Sharples. When the principles of breeding and of inheritance are better understood, we shall not hear ignorant members of our legislature rejecting with scorn a plan for ascertaining by an easy method whether or not consanguineous marriages are injurious to man. You have heard of the new chemical nomenclature endeavored to be introduced by Lavoisier, Fourcroy, &c. Other chemists of this country, of equal note, reject it, and prove in my opinion that it is premature, insufficient and false. These latter are joined by the British chemists; and upon the whole, I think the new nomenclature will be rejected, after doing more harm than good. There are some good publications in it, which must be translated into the ordinary chemical language before they will be useful. Letter to Dr. Currie (Paris, 1788). In Thomas Jefferson and John P. Foley (ed. ), The Jeffersonian Cyclopedia (1900), 135. From H.A. Washington, The Writings of Thomas Jefferson (1853-54). Vol 2, 544. [In the Royal Society, there] has been, a constant Resolution, to reject all the amplifications, digressions, and swellings of style: to return back to the primitive purity, and shortness, when men deliver'd so many things, almost in an equal number of words. They have exacted from all their members, a close, naked, natural way of speaking; positive expressions; clear senses; a native easiness: bringing all things as near the Mathematical plainness, as they can: and preferring the language of Artizans, Countrymen, and Merchants, before that, of Wits, or Scholars. The History of the Royal Society (1667), 113.